Rank: #7 out of 164. Heart Rate Monitor Does the elliptical include heart rate monitors on the handles? Elliptical displays offer a wide range of features that vary greatly from one machine to another. The display can be as simple as analog LED lights that show time and distance traveled or as complex as a fully functioning TV screen with cable network connectivity. Displays vary in size and type, with higher end machines displaying more stats (time, distance, incline, speed, heart rate, workout program status, etc.) and offering more advanced features (such as a virtual tour that simulates traveling through real-life environments). There are positives and negatives to this level of complexity. On the plus side, sophisticated displays allow you to easily monitor and adjust your workout based on the information presented. They may also provide a distraction from the dull pace of elliptical exercise. At the same time, this kind of distraction can be harmful to your workout because it may cause you to fall or injure yourself or be overly conscious of the clock and distance. Advanced display screens or TV screens could have the added benefit of linking with your smartphone, so you can watch video content on the display as you run. The suite of features will be dependent on your needs but know that you’ll pay significantly more for complex displays and TV screens. Display Screen Does the elliptical console have a screen? Media/TV Capabilities Can the elliptical’s screen play TV or media, such as movies? Metrics Displayed What metrics are displayed on the elliptical console/screen? Touch Screen Is the display touch screen? Device Shelf For holding your smartphone, tablet, or other media device. Built-In Fan Does the elliptical console include a fan? Sync with Third Party Apps Can you sync workout data with third part apps, such as MyFitnessPal and FitBit? Ellipticals separate their warranties into four sections: Frame, Parts, Labor and Brake System. Across all of these categories, warranties are an important feature to assess in ellipticals because the length of the warranties are an indication of the company’s confidence in the machines ability to last. 90-day warranties show that the manufacturer doesn’t believe the elliptical hold up past the first 90 days of ownership. Frame warranties should be lifetime warranties. Anything less than that is an indication of a cheaply made machine and buyers should be wary. Parts warranties range from 90 days to 5 years to lifetime warranties. For light use, 90 days to 1 year might be an acceptable parts warranty, though you should not expect that machine to be extremely durable. Labor warranties range from 90 days to 3 years. For light or moderate use, choose an elliptical with at least 1-year labor warranty. If you plan to use the machine long and often, it’d be best to find a labor warranty of 2-3 years. Note that labor warranties are typically shorter than parts warranties, which means that, up until a certain point, the company will cover the cost of parts, but not the cost of paying someone to fix it. Finally, like the frame warranty, the best brands offer you a lifetime warranty on the brake system, which provides resistance on the elliptical. If you have an electromagnetic brake system, you likely won’t have any issues, but it always helps to have reassurance that you’re covered if something goes wrong. Parts Warranty What is the parts warranty for this elliptical? Frame Warranty What is the warranty on the frame alone? ProForm Endurance 520 E is a very popular and one of the more expensive options. 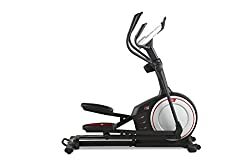 It's in the top 3 bestselling elliptical trainers and has many popular alternatives in the same price range, such as NordicTrack E 7.5Z or Proform Smart Strider 495 CSE . ProForm Endurance 520 E is $250.99 more expensive than an average elliptical trainer ($349).